Many apartments come with a balcony for you to relax on. As nice as balconies are, they can sometimes be small and boring. 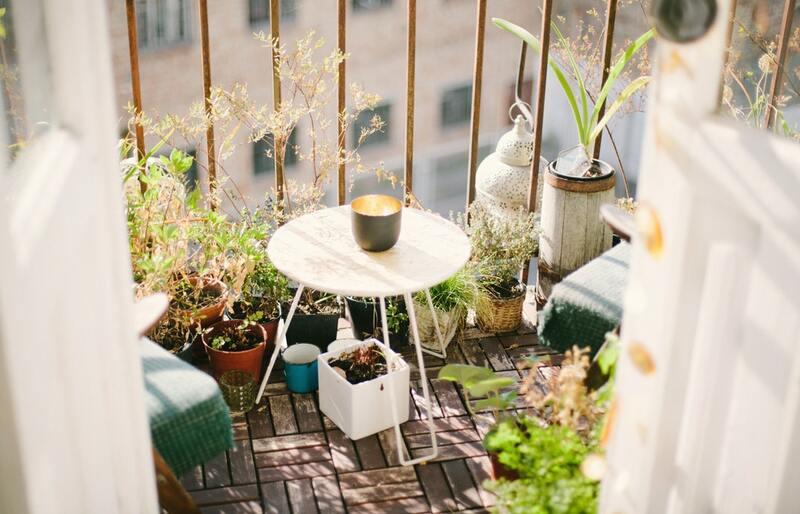 If you have been wondering how you can improve your balcony space, you have come to the right place. In this article, I'll be going over the best balcony ideas for your apartment balcony. These balcony ideas will help spruce up your balcony so that it is an enjoyable place to be. Hopefully, after this article, you'll be inspired and excited to get started on fixing up your balcony. Let's get started. If you are a Do-It-Yourself kind of person, you may enjoy building some benches on your balcony. 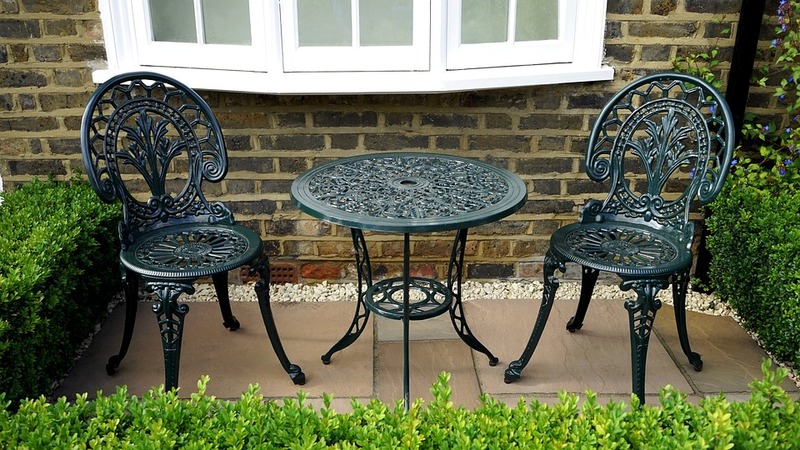 With built-in benches, you won't have to worry about the wind blowing your benches over. Benches are also nice because they don't take up as much space as chairs in the middle of your balcony would. Long benches also allow more seating than other seating options would, which allows you to invite guests over to your balcony. Has it always been your dream to eat breakfast on your balcony as you watch the sunrise? If so, then you will definitely want to invest in a table for your balcony. If you have a small balcony, it is best if you buy a smaller table. That way, you will still have some space on your balcony. If possible, try putting your table in a corner so that it doesn't take up too much space. When it comes to the types of tables to choose from, the ideas are endless. Perhaps you want an ottoman table that allows you to store items inside of it. If you want to save on space, a folding table is a great option. That way, you can fold the table for when you don't need it. If you like recycling materials, you may be interested in making a pallet table. A pallet table is a great way to reuse old pallets. Another creative option is to use hanging tables. Hanging tables hang from the roof of your balcony. They make your balcony look extra unique and creative. Tables made from tires are another great option. Similar to the pallet table, tire tables are made out of two or more recycled tires. All you have to do is paint the tires and add a wood board on top of it. Tires can also be used to make a comfortable chair. To transform your table into a seat, simply add a cushion to the tires. A rug can add more color and beauty to your balcony than you may think. If you are looking for great balcony ideas, adding a rug is a great option. Rugs come in many different designs and patterns. Perhaps you want a rug with lots of stripes on it. Or maybe you want your rug to be one bright color. Make sure you choose a rug that is durable and made for the outdoor weather. Because rugs can be expensive, it may be a good idea to make your own. There are so many ideas for making your own DIY rug. You can weave your own rug, or you can use an old rug that you have and decorate it so that it looks new. Have fun when choosing or making a rug for your balcony. Lights are another great balcony decoration that can be used for lighting up your balcony at night. When it comes to lighting options, there are so many ideas available. Lanterns often have a vintage look to them and therefore look great on a vintage-styled balcony. Solar lights work great too because they don't require electric or batteries. Simply install them and let the sunlight do its work. Another great option is string lights. String lights come in many different styles. Some of them have bulb-shaped lights, while others have stylish designs on them. String lights don't take up any space on your balcony since they can be hung. Whatever you choose to do, adding lighting to your balcony is one of the best balcony ideas. While benches and chairs can often look good alone, pillows are what add beauty to them. If you are wanting to spruce up your balcony, consider adding some pillows to your furniture. Choose pillows that are bold and colorful. If you are feeling crafty, there are many homemade pillow patterns you can follow. Make sure the pillows you choose are made of materials that are durable enough to withstand the weather. On rainy and snowy days, you may want to bring in your pillows so that they don't become damaged. You should also bring your pillows in on windy days so that they don't blow away. Flowers add so much color to a room. If you want to add some beauty to your balcony, consider planting some flowers. There are so many different flowers to choose from that would look great on your balcony. If you don't have enough room for potted flowers, perhaps this next idea will fit your needs better. Plants add so much beauty to a living space. Unfortunately, plants also take up a lot of room. If you are wanting to grow plants but not worry about them taking up space on your balcony, you may be interested in a vertical garden. A vertical garden allows you to grow plants on the side of your balcony walls. You can grow almost anything you want in a vertical garden. You can even grow vegetables in a vertical garden if you wanted to. Use an awning to provide some shade on your balcony. An awning or overhang is a secondary covering attached to the exterior wall of a building. Awnings are great for providing shade during the summer, as well as preventing rain from reaching your balcony. Depending on how large your awning is, you may be able to sit out on your balcony even while it is raining. Add some privacy to your balcony by adding bamboo fencing or bamboo shades to your balcony railings. Better yet, consider growing bamboo itself. Other tall plants will work well for providing privacy too. If you are wanting to relax on your balcony, it doesn't get any more relaxing than sitting on a hammock. Adding a hammock to your balcony is a great seating option. It provides a place for you to sit, take a nap, or read a book in the sunshine. Attaching a hammock to a balcony is easier than you may think. To do it, you'll need to attach it to the balcony railings. The railings will act like a tree, which is what you would normally hang a hammock on. Measure the length of the hammock, and then measure the distance between the balcony railings. Mark two points that are equal to or slightly farther apart than the length of the hammock. If parallel railings are not far enough apart, measure the distance between railings near a corner and mark at points that are far enough apart to hang the hammock. The distance between the points must meet or exceed the total length of the hammock. Drill pilot holes in the balcony railings on the marks using a drill and a drill bit. They need to be half the size of the eyebolts you are using to hang the hammock. Place the end of an eyebolt into one of the pilot holes and turn it clockwise until it is as tight as you can get it with your hand. Insert a screwdriver into the loop on the eyebolt and tighten it. Repeat this process for the second eyebolt in the other pilot hole. Tie one end of the hammock onto one of the eyebolts with a tight knot. Make sure it is secure. Tie the other end to the other eyebolt in the same manner. And voila! You've got yourself a hammock to relax on. Are you wanting to add some flooring to your apartment balcony? If so, you may want to try this idea. Instead of installing hard flooring, install artificial turf. Artificial turf is weather-resistant and can add a unique look to your balcony. It is also soft, making it comfortable to walk on. Once your artificial turf is worn out, you should be able to recycle it. Therefore, nothing goes to waste! Artificial turf is a great flooring option. 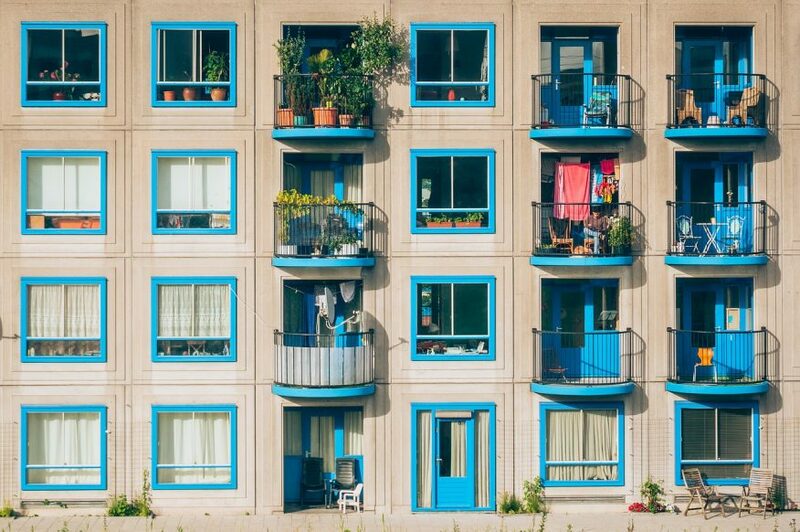 I hope this article has inspired you to start improving your apartment balcony. From adding seating to growing your own vertical garden, these balcony ideas will help make your balcony a more enjoyable place to be. Once you add some of these balcony ideas to your balcony, you may enjoy spending time on your balcony. Balconies allow you to get sunlight and fresh air, all the while providing a relaxing place to be. These balcony ideas help make your apartment balcony a more comfortable and cozy place to be, as well as more stylish. A lot of the balcony ideas in this article can be made yourself. 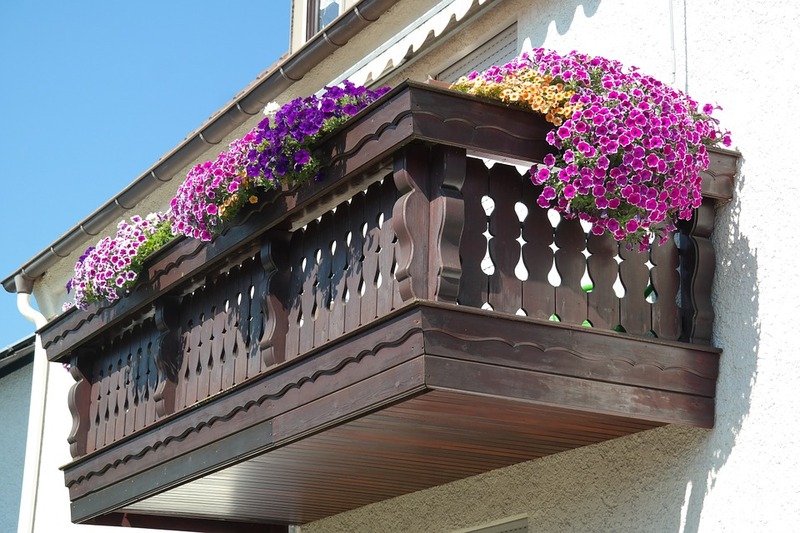 Have fun working on improving your balcony as your next project. I hope this article has helped give you some ideas for sprucing up your balcony. Have fun!